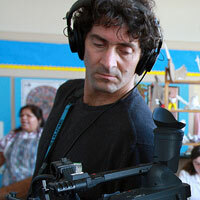 Ken Schneider is a producer, editor, and sound recordist for PatchWorks films. He is also a freelance editor whose credits include award-winning documentaries on a broad range of subjects, from art and literature to war and peace, immigration, disability and social justice. Schneider co-edited the feature documentary Regret To Inform, winner of a Peabody Award, an Indie Spirit Award and a Sundance Film Festival Directing award, as well as the IDA Award for most distinctive use of archival footage. Regret To Inform also was nominated for an Academy Award and a National EMMY. Other editing credits include Bolinao 52 about Vietnamese boat refugees; the PBS American Masters specials Orozco: Man of Fire and Ralph Ellison: An American Journey; P.O.V. special Freedom Machines, about the convergence of disability, technology and civil rights; PBS primetime special The Good War and Those Who Refused to Fight It, which aired on Martin Luther King's birthday and won best historical documentary awards from both the American Historical Association and Organization of American Historians; PBS special and Golden Gate award-winner Store Wars: When Wal-Mart Comes to Town; Frontline's Columbia-Dupont Award winning School Colors, a look at integration and segregation 40 years after Brown versus Board of Education; and Ancestors in the Americas, Part 2: Pioneers in the American West, about the Chinese-American experience. Schneider has collaborated with Nina Wise, the dancer/performance artist; Charlie Varon, the solo theater performer; Rob Epstein and Jeffrey Friedman, Academy award-winning filmmakers, and Richard Beggs, Academy award-winning sound designer, among others. Ken has consulted on dozens of documentaries, and lectures at San Francisco City College, the San Francisco Art Institute, and New York University.